Competitions are weekly, every Monday. Don’t worry if you can’t make all the events. The league will go on for several months. Prizes for winners each event. Play one event, or play more! Get your name in the world pinball database and receive a seed/ranking! Cost is $20 one-time fee to join the league. There may or may not be a small fee per each individual competition – this is at the discretion of the league night director (some nights there may be a cash prize for the winners). 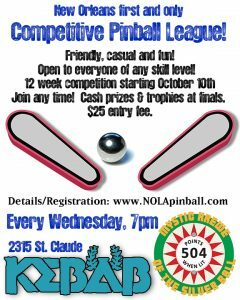 All league participants will be invited to a special private party at the Mystic Krewe’s PinChurch in association with the season-end finals. Interested? Of course you are! Sign up here! There is a one-time fee of $25 to sign up for the league. There are no other costs except quarters to play the games in the tournament (typically set for .50/game). Additional prizes will be given out to final winners along with trophies for each week’s winners. Registration fee is non-refundable and is one-time per season. Casual / fun play – everybody helps each other – don’t be intimidated if you’re new to competitive pinball – this league is for you! Individual league nights will have a variety of tournament types at the discretion of the director that night. Options include standard bracketed head-to-head competition, team-based competition, pin-golf, or machine qualifications (where not everybody has to be in attendance to qualify – just post a score on a machine in a certain time period). There may be a small entrance fee (i.e. $2-$5) on individual league nights if the participants agree, so that there may be a cash prize also available to winners – at present it’s looking like there may not be an event-based fee, but if participants want an additional cash prize for the evening’s event, that may be an option if all agree. Winners of each league event will be tabulated and awarded points based on their finishing position. Our scale is: 100 points for first, 95 for second, 92 for third, etc. We will take the top 8 finishes for each competitor to determine the overall ranking and qualifications for the finals of the league. This allows people to miss league events and still potentially qualify for the finals. It’s more important that people enjoy playing so we will encourage all types of players, even casual ones who can’t attend every event. The finals for the season will be TBA with extra special prizes and fun! The league may or may not be IFPA sanctioned – up to the tournament organizers (feel free to inquire), but regardless we will follow standard IFPA rules regarding tournament operation. For more information see the IFPA Rules.